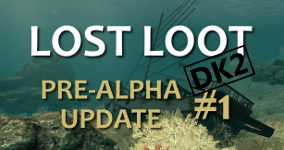 The DK2 compatible version of Lost Loot is here! The 0.4.3 runtime is required and it is built with the 0.4.3.1 version of the sdk. The build is a DX11 build and should run fine using direct mode. If you do run it in extended mode, I recommend forcing it to DX9. I have still experienced problems using DX11 in extended mode. There are details in the instructions on how to force it to use DX9. With these latest updates, my laptop now officially runs direct mode properly! This is a big deal for me. I have an MSI GS70 Stealth Pro with an Nvidia Optimus setup including an Intel 4600 GPU and an Nvidia 870M GPU. I have been concerned from the beginning that I would never be able to get direct mode working. Up until this latest round of changes all I would get is crashing or major judder problems. So, anyone with a laptop and Nvidia Optimus should have hope that these configurations will be supported over time. There may still be latency with these, however the prediction and time warping is likely doing a good job of hiding it, Direct mode feels much better to me than extended and I have high hopes going forward that we will finally get to a very comfortable VR experience. Enjoy the DK2 version of Lost Loot and don’t forget to rate the game and give feedback on Oculus Share! Tagged direct mode, dk2, lost loot, oculus rift, virtual reality, vr.